Report sent to CWL CIO from Apostleship of the Sea on their very valuable work. Catholic seafarers are away from the sacraments for up to nine months due to the nature of their work. As ships are often now in port for not much more than 24 hours, getting to Mass or the Sacrament of Reconciliation can be very difficult and often impossible,” says Pat Ezra, Apostleship of the Sea (AoS) port chaplain to East Anglia. The maritime industry and the seafarers who work in it might seem remote from our daily lives. Yet around 90% of the goods imported into the UK arrive by ship. This includes everything from coffee and cars to fridges and oranges. The seafarers who bring all of this are often away from their families for months. This year July 8 is Sea Sunday, when the Church asks us to pray for seafarers and support the work of AoS, whose chaplains and ship visitors provide practical and pastoral help in ports around the coast of Britain. 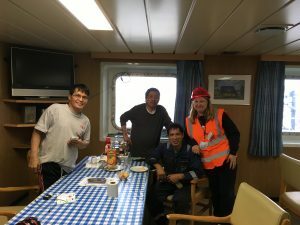 An example of the importance many Catholic seafarers attach to their faith occurred when Pat was emailed by one of the crew of MV Industrial Destiny. He asked for a priest to go on board the ship when it docked in Felixstowe, as one of his crew mates had been lost at sea. Pat contacted Fr John Barnes, parish priest of St Felix Church in Felixstowe, and the two of them visited the ship. “Fr John Barnes was pleased to help and we boarded the vessel at the Captain’s invitation. They were on a very short turnaround time and would only be in port for a maximum of six hours,” Pat said. After all who wanted had received Communion the captain asked Fr John to bless the bridge and engine room. “The ship’s crew was consoled by the visit of a priest and the blessing. After six hours in port they then departed for a three-hour stop in Newcastle before heading to Denmark,” said Pat. To help nurture the spiritual life of seafarers, Pat often carries with her prayer cards and copies of Bible Alive when she goes on board a ship. During Lent and Easter, she travelled around the ports on the East Anglia coast, distributing ashes, blessed palms and, on Easter Sunday, gifts.